We got started from our hotel in Amarillo and headed over to Route 66. First, we spotted this now-closed shop called Spudnuts Coffee and Donuts. 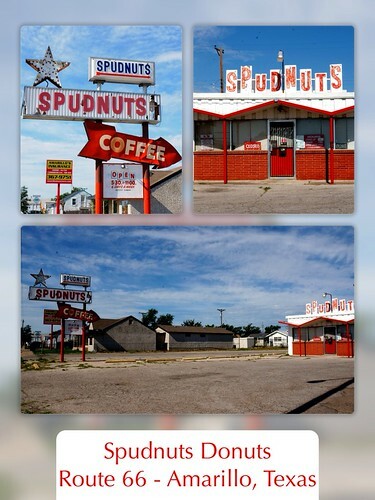 My grandson got a huge laugh out of “Spudnuts,” so for quite a while he amused himself by repeating “Spudnuts”…over and over and over…we felt alot like Charlie Babbitt in Rain Man, as Raymond repeated 97X, BAM – the future of rock and roll, 97X, BAM – the future of rock and roll…you get the idea. 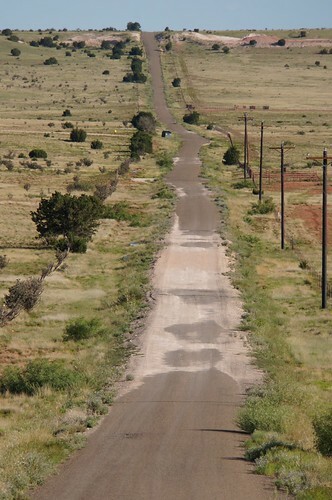 Next up was a newer addition to Route 66, but not Amarillo. 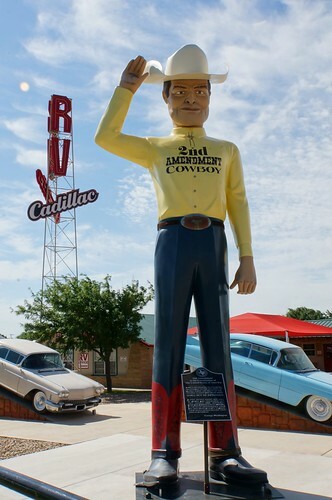 This cowboy statue used to call his home a barbecue joint in Amarillo, but he was sold at auction earlier this year and now resides at the Cadillac Ranch RV Park on Route 66 in Amarillo…of course, not far from Cadillac Ranch. Then we motored on through Vega and Adrian. 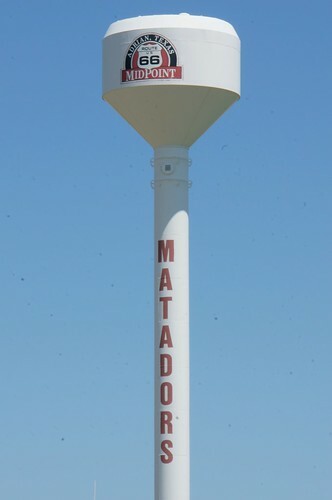 Just for my grandson, more water tower excitement, complete with a Route 66 shield, which he’s also fond of spotting. So, this was 2 for 1! We stopped by the Sunflower Station gift shop, owned by Fran Houser, former owner of the adjacent Midpoint Cafe, and the inspiration for Flo, from the Route 66 themed Pixar film, Cars. Fran had an abundance of die cast Cars, and we picked up a Doc Hudson (in full Fabulous Hudson Hornet paint scheme and crew chief headset). We chatted with Fran for a bit and promised not to wait 12 years to come back, however, she currently has the Sunflower Station up for sale so she can retire (again) and spend more time visiting with family. More info on the sale can be found on Ron Warnick’s Route 66 News site, here. 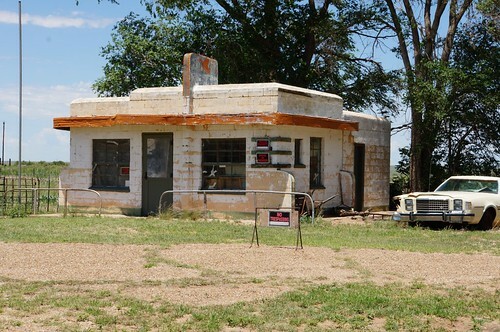 At the Texas-New Mexico border, is the “ghost town” of Glenrio. 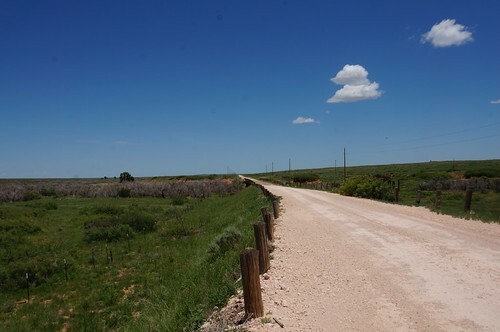 The town sits on the border, so there is a Glenrio, Texas and a Glenrio, New Mexico. 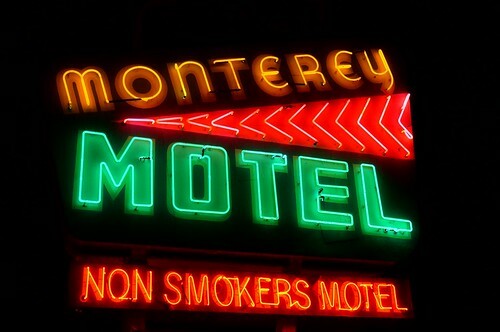 …which Pixar made into “The Glenrio Motel.” Again, for more locations that inspired Cars, see this link. After crossing into New Mexico, we took the pre-1950’s alignment from Glenrio to San Jon. It was paved, but is now dirt. It is very reasonably passable when dry. We then arrived in Tucumcari, another town which provided alot of inspiration to Pixar for Radiator Springs. 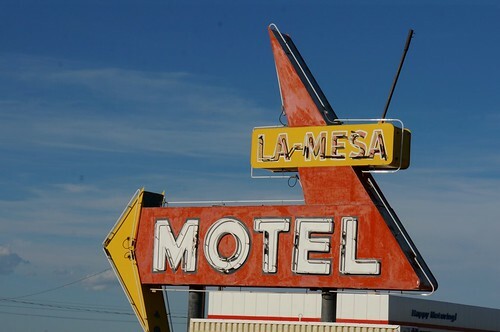 Tucumcari is a neon paradise, though it was very early, so we were not staying here (I had stayed here in in 2000 and 2002, though, and would love to again!). 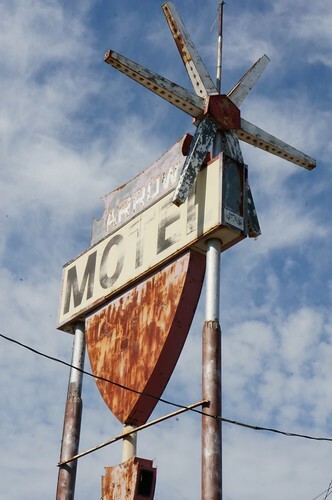 Here’s a collage of some of the signs in Tucumcari (many are from the return trip too). For more from Tucumcari, see the slideshow at the bottom. 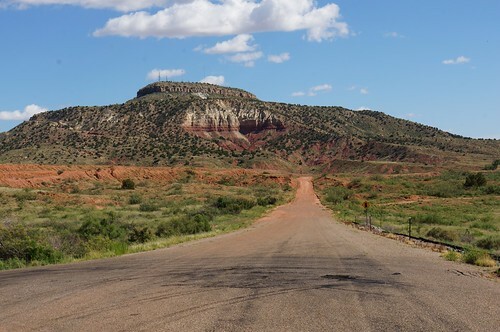 Of course, another prominent – and natural – feature is Tucumcari Mountain, which inspired the mountain in Cars, shaped like a radiator cap. 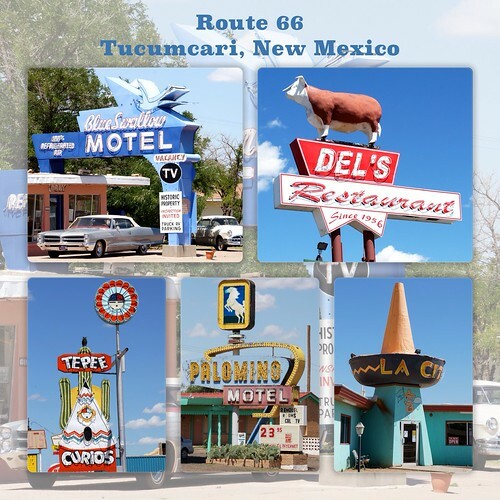 We shopped at Tee Pee Curios and picked up some souvenirs, then left Tucumcari, continuing on 66 through Newkirk, and as we passed Cuervo, we took the pre-1950’s alignment of Route 66 known as the Cuervo Cutoff. If you look on my trip map above, you can follow along our path. We took the “dog leg” route, but didn’t take the diagonal section (we had taken part of that during our honeymoon in 2002). 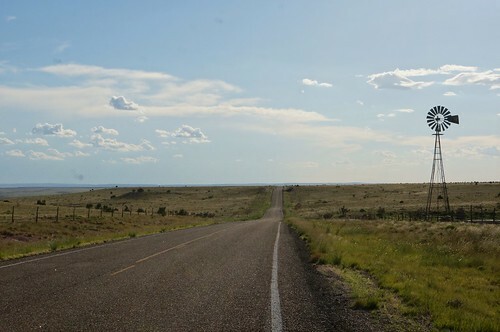 The next major city along Route 66 in New Mexico is Santa Rosa. 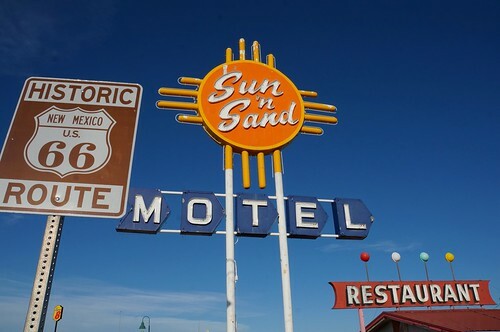 Many towns along Route 66 in various states are preserving – and restoring – their neon signs and buildings. Sometimes the building is long gone, but the signs remain, and they are being restored. But it sure appears New Mexico Route 66 is really working hard at restoring signs, because there are some beauties in this state! I wish I could have been in every town and city with neon during the golden hour. Ahhh, the dream of early retirement…back to reality! Here are few shots from Santa Rosa. Like most of this trip – I didn’t take all my photos westbound…we were also taking 66 eastbound, so I saved some photos for the return trip! Past Santa Rosa, we continued on I-40. There’s a fragment of post-1937 Route 66 at the westbound rest area at exit 252, just past the on ramp back onto I-40, which you can see on my map. We saw this in our friend Jerry McClanahan’s excellent book, EZ66 Guide for Travelers, which you can pick up at Amazon. 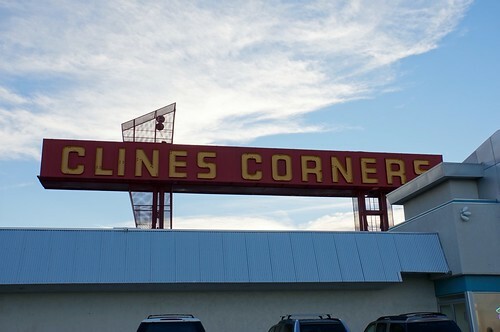 We continued on I-40 until Clines Corners, a large travel center, which dates back to 1934 when it was started by Roy E. Cline as a filling station and cafe to the south of its current location. In 1937, it was relocated to its present location. 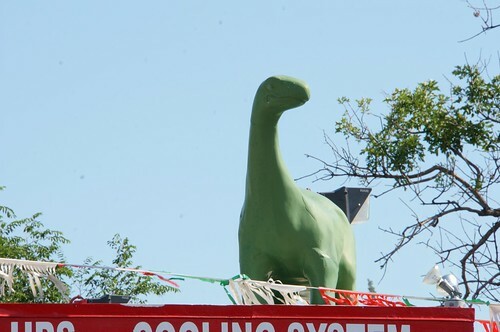 It’s a very cool stop, with tons of souvenirs, curios, and other sundries. Quite a lot for a 3 year old to get (over)excited about, so we couldn’t spend as much time as we would have liked, and it was getting late. The sun was setting! From Clines Corners, 66 continues to follow I-40 until Moriarty. By this time, however, it was dark and we were all pretty tired (did we say yet that traveling with an over excitable 3 year old is tiring? LOL). We wanted to stay in Albuquerque, so we continued on I-40. We were also taking 66 back, so if we needed to skip any parts of 66 on the way out, we would take them on the way back. We decided to stay at a mom & pop motel in Albuquerque called the Monterey Motel. 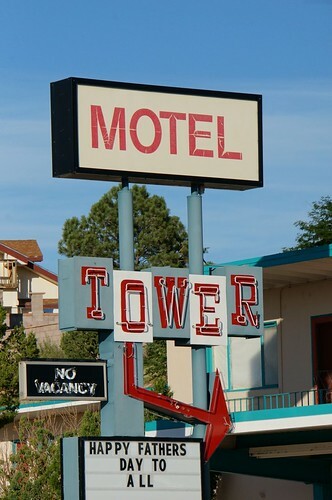 It’s a non-smoker’s motel and they mean it. From their neon sign to their website, they make it perfectly clear that’s how they want the air there – so NO smokers. Asthmatics like me do appreciate that. It was a very nice place – clean, well decorated and comfortable. I would definitely stay there again and I’d like to. We rolled into Albuquerque far too late, and with a tired toddler in tow, we couldn’t take any nighttime neon shots (though of course, I’d prefer the golden hour anyway). Maybe next year. But until then, we hit the sheets, ready to seize the next day – taking some photos of Wild Hogs filming locations around Albuquerque…fun!! Below is a slideshow of all of the photos from this portion of the trip. Click any photo to stop the slideshow and view the photos on my Flickr site. If you are on an iOS device and do not see the slideshow below, click here to view the set on Flickr.